Optimization modeling and algorithms are key components to problem-solving across various fields of research, from operations research and mathematics to computer science and engineering. Addressing the importance of the algorithm design process. Deterministic Operations Research focuses on the design of solution methods for both continuous and discrete linear optimization problems. 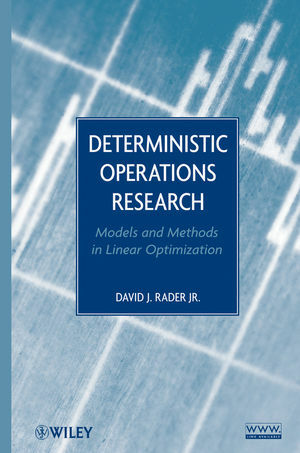 The result is a clear-cut resource for understanding three cornerstones of deterministic operations research: modeling real-world problems as linear optimization problem; designing the necessary algorithms to solve these problems; and using mathematical theory to justify algorithmic development. Treating real-world examples as mathematical problems, the author begins with an introduction to operations research and optimization modeling that includes applications form sports scheduling an the airline industry. Subsequent chapters discuss algorithm design for continuous linear optimization problems, covering topics such as convexity. Farkas’ Lemma, and the study of polyhedral before culminating in a discussion of the Simplex Method. The book also addresses linear programming duality theory and its use in algorithm design as well as the Dual Simplex Method. Dantzig-Wolfe decomposition, and a primal-dual interior point algorithm. The final chapters present network optimization and integer programming problems, highlighting various specialized topics including label-correcting algorithms for the shortest path problem, preprocessing and probing in integer programming, lifting of valid inequalities, and branch and cut algorithms. Concepts and approaches are introduced by outlining examples that demonstrate and motivate theoretical concepts. The accessible presentation of advanced ideas makes core aspects easy to understand and encourages readers to understand how to think about the problem, not just what to think. Relevant historical summaries can be found throughout the book, and each chapter is designed as the continuation of the “story” of how to both model and solve optimization problems by using the specific problems-linear and integer programs-as guides. The book’s various examples are accompanied by the appropriate models and calculations, and a related Web site features these models along with Maple™ and MATLAB® content for the discussed calculations. Thoroughly class-tested to ensure a straightforward, hands-on approach, Deterministic Operations Research is an excellent book for operations research of linear optimization courses at the upper-undergraduate and graduate levels. It also serves as an insightful reference for individuals working in the fields of mathematics, engineering, computer science, and operations research who use and design algorithms to solve problem in their everyday work. David J. Rader Jr., PhD, is Associate Professor of Mathematics at Rose-Hulman Institute of Technology, where he is also the editor of the Rose-Hulman Institute of Technology Undergraduate Mathematics Journal. Dr. Rader currently focuses his research in the areas of nonlinear 0-1 optimization, computational integer programming, and exam time timetabling. 1. Introduction to Operations Research. 1.1 What is Deterministic Operations Research? 1.2 Introduction to Optimization Modeling. 1.3 Common Classes of Mathematical Programs. 2.6 Multiperiod Models: Work Scheduling and Inventory. 2.7 Linearization of Special Nonlinear Models. 2.8 Various Forms of Linear Programs. 3. Integer and Combinatorial Models. 3.3 Models Using Logical Constraints. 3.5 Sports Scheduling and an Introduction to IP Solution Technques. 4. Real-World Operations Research Applications: An Introduction. 4.2 Facility Location and Network Design Models. 4.3 Applications in the Airline Industry. 5.1 Exact and Heuristic Algorithms. 5.2 What to Ask When Designing Algorithms? 5.3 Constructive versus Local Search Algorithms. 5.4 How Good is our Heuristic Solution? 5.5 Example of a Local Search Method. 5.8 Designing Exact Methods: Optimality Conditions. 6. Improving Search Algorithms and Comvexity. 6.1 Improving Search and Optimal Solutions. 6.3 Convexity: When Does Improving Search Imply Global Optimality? 6.4 Farkas’ Lemma: When Can No Improving Feasible Direction be Found? 7. Geometry and Algebra of Linear Programs. 7.1 Geometry and Algebra of “Corner Points”. 7.2 Fundamental Theorem of Linear Programming. 7.3 Linear Programs in Canonical Form. 8. Solving Linear Programs: Simplex Method. 8.2 Making the Simplex Method More Efficient. 8.3 Convergence, Degeneracy, and the Simplex Method. 8.4 Finding an Initial Solution: Two-Phase Method. 9.4 Another Interpretation of the Simplex Method. 9.6 Economic Interpretation of the Dual. 9.7 Another Duality Approach: Lagrangian Duality. 10. Sensitivity Analysis of Linear Programs. 10.3 Use of Sensitivity Analysis. 11. Algorithmic Applications of Duality. 11.5 Primal-Dual Interior Point Method. 12.1 Introduction to Network Optimization. 12.4 Minimum Cost Network Flow Problems. 13. Introduction to Integer Programming. 13.1 Basic Definitions and Formulations. 14. Solving Integer Programs: Exact Methods. 14.3 Valid Inequalities and Cutting Planes. 14.4 Gomory’s Cutting Plane Algorithm. 14.5 Valid Inequalities for 0-1 Knapsack Constraints. 15. Solving Integer Programs: Modern Heuristic Techniques. 15.1 Review of Local Search Methods: Pros and Cons.